Are you ready for a magical adventure? Summon creatures! Shoot fire! Grow a beard! Collect spells, upgrades and items to tailor your own recipe for success. Battle other Wizards in intense RTS-duels by using the right spell at the right time. As you progress you will discover new spells and be able to use new tactics. This game is all about magic and spells, and you take the role as an aspiring Wizard searching for fame and glory. Your opponents will play in different ways, so you will need to try out new spells and tactics to beat them. As you advance you will meet tougher and tougher opponents. Do you have what it takes to be the best? You play the role as an aspiring Wizard searching for fame and glory. Set your imagination free and create a wizard that express who you are or who you want to be. Customize the furniture in your study in a way that suits your wizard. Cosy or scary, everyone can find something suitable. This game is all about magic and spells. Your opponents will play in different ways, so you will need to try out new spells and tactics to beat them. 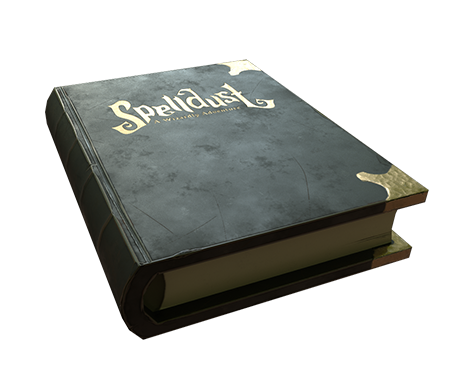 Build a spellbook that suits your playstyle to become the most powerful wizard. Find ancient spell recipes on your journey and use the powers of alchemy to increase your powers and expand your spellbook. Magical recipes need ingredients and there’s lots of magical ingredients to discover in Spelldust. Everything from basilisk eyes to imp spit and devil tongues. As you advance you will meet tougher and tougher opponents. Do you have what it takes to be the best? Challenge your friends or compete on the global leaderboard to find out who is the greatest wizard. Compete against other wizards around the world on the global leaderboard. Win multiplayer games to climb the ladder and rise to the top. Playing Spelldust is even more fun if you do it with your friends. Invite and challenge them to find out who is the greatest wizard of all or just show off your fancy gear.